Being a worship pastor for nearly 35 years and doing anywhere from 5 to 6 services a weekend, I know that it’s important to perform to the best of your abilities – service-in and service-out. As a worship leader, your job is to connect the crowd to God, inspire them, motivate them and get them connected to Him. For many churches around the world, music is a key element in achieving this. The more musicians and singers on stage, the more important it becomes to have sonic clarity. When you can’t hear your instrument and your team’s instruments clearly, it is hard to turn your focus away from the mechanics of making music. This is often a great distraction that worship teams struggle with every weekend. This may sound like an oxymoron, but one of the keys to connection is actually isolation. When you can control the mix and volume of the music you are making, you will ﬁnd connecting with the crowd more attainable. When playing music with the church band, it’s important to also isolate all of the other instruments within the group so you can better hear yourself. If you can’t hear yourself over the music, your natural reaction is to sing or play louder, causing undesirable results such as straining, unpleasant tone and overall hard-to-follow music accompaniment for the most important choir… your congregation. I’ve found that one of the best ways to curtail these issues is to invest in a good pair of in-ear monitors (IEMs), preferably custom in-ear monitors. 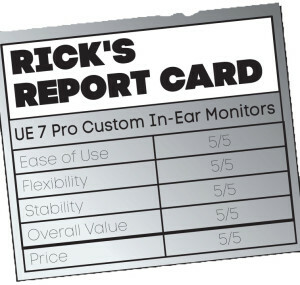 I have used Ultimate Ears UE 7 Pro (UE7) for the past ﬁve years and UE Vocal Reference Monitors (VRM) for two years now. They offer a variety of custom – and even some universal – products that speak to many different needs. For instance, the Ultimate Ears Vocal Reference Monitors were tuned speciﬁ cally for singers. I ﬁnd them most valuable when I’m going into a situation where there is little to no time for a sound check. They ﬁlter out sound frequencies that fall outside the vocal sound spectrum, leaving only the vocals in the mix, which is ideal for when you’re performing without the sound check. With the VRMs, I know that I will always be able to hear my voice. They have a 3-way crossover and noise isolation of -26 dB. They also have a female version that rolls off lows below 200 Hz, and a male version that rolls off at 120 Hz. The UE 7 Pro Custom In-Ear Monitors are simply the most versatile IEMs I own. They are based on a three-driver structure with a noise isolation of -26 dB and frequency response of 5Hz-22kHz. With these monitors, I know that when I am playing piano or guitar I will hear full-bodied sound, clarity and a brilliant response. 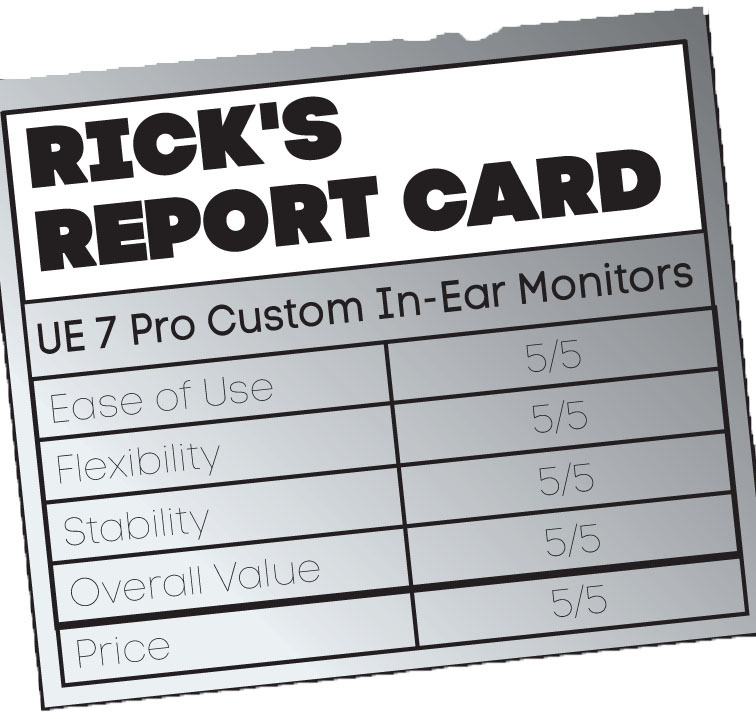 In my opinion, I see the UE7s as the ‘director’s model,’ they are excellent for all instruments and ideal for live performances. The faceplates of the UE7s can be ordered in a variety of colors and even personalized with your own artwork. Tech specs aside, the custom IEMs are perfectly molded to ﬁt the inside of your ear, making them ultra-comfortable with a secure ﬁt. When I placed my order, the UE team helped identify the right product for me and guided me to the closest audiologist so they could take my ear impressions. The audiologist sent my molds to the Ultimate Ears lab, and from there the team in Irvine, CA built my custom IEMs. Within a few weeks, they were shipped directly to me in a beautiful case that protect them when I travel. Beyond the customization and incredible sound quality of UE comes great customer service. They have a one-year warranty and, as long as you take good care of them, there is very little cost to owning a pair of customs. Bottom line, there’s a comfort level for me recommending UE. The performance improvement and the quality of what my worship team is able to do makes them well worth the money. Because, after all, is there really a price to protecting your ears?